"Funny Little Man" is a story about an immigrant from a far-off world in another star system who has come to this country in hopes of pursuing The American Dream. He's found an entry-level position in an office at a government job, and is doing his very best to fit into his new environment. 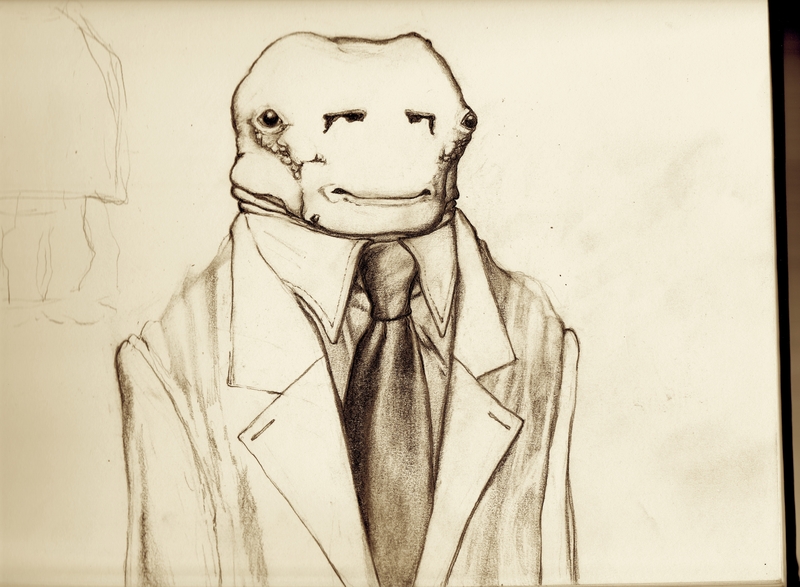 In his attempt to assimilate into this "alien society," he's purchased a suit and tie from Goodwill to wear at work, rented a studio apartment, and even carries a briefcase - although he still doesn't know what he's supposed to carry inside of it yet. His primary office duties include: sharpening pencils, making fresh coffee, and eliminating computer viruses that crop-up in the office network simply by deleting them with the power of his mind. Mostly he just stares at the fluorescent bulbs in the ceiling and identifies patterns in the flickering light that seem to follow a sequence of prime numbers. This confuses him because he's convinced that another race of extra-dimensional entities is attempting to communicate with his co-workers, yet no one seems to notice or care in the least. Of all of is office duties however, he enjoys sharpening pencils the most. Since no one in the office has any idea how to pronounce his name, they just refer to him as "that funny little man." When he overhears this coming from his co-workers, he misunderstands the true meaning and simply believes that they feel he is "fun to be around,"...and this makes him very, very happy.